4 Commercial Real Estate & Properties in Carrington are listed in 2 categories. We have 3 Industrial Warehouses Sale & Lease and 1 OfficesSale & Lease . 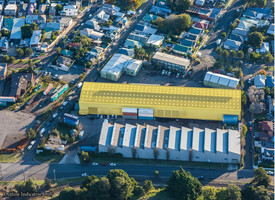 Port Precinct Clearspan Warehouse From $80 p/m² pa + O.. Perfect business use or retail in busy residential strip Near Newcastle Port in leafy position Opposite Post Office and close to local Hotel Ideal for giftware, cafe, etc Contact Patrick Mitchell on 0421 000 033 DISCLAIMER We have obtained all information provided here from sources we believe to be reliable; however, we cannot guarantee its accuracy. Prospective purchasers are advised to carry out their own investigations and satisfy themselves of all aspects of such information including without limitation, any income, rentals, dimensions, areas, zoning and permits.